Firmly grounded by the hallmark strengths of all Norton Anthologies ”thorough and helpful introductory matter, judicious annotation, complete texts wherever possible ” The Norton Anthology of English Literature, The Major Authors has been revitalized in this Eighth Edition through the collaboration between six new editors and six seasoned ones. 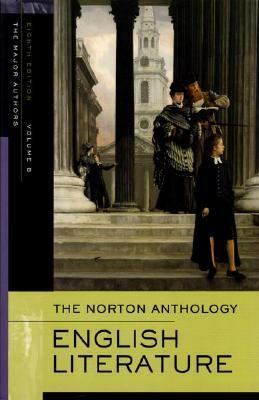 Under the direction of Stephen Greenblatt, General Editor, the editors have reconsidered all aspects of the anthology to make it an even better teaching tool.The Norton Anthology of English Literature, Vol. B: The Romantic Period through the Twentieth Century and After, 8th was published 2006 under ISBN 9780393928310 and ISBN 0393928314. Loading marketplace prices 20 copies from $1.76 How does the rental process work?